It seems like a silly question in your mind. Carolina rampaged to a 15-1 regular season record before destroying two worthy playoff opponents to reach the Super Bowl. “But look how dominant Carolina has been the past two games. Can Von Miller even tackle Cam Newton?” you reply. You’re unconvinced, thinking Carolina will easily cover the 5.5 points. In the first quarter, Von Miller strips Cam Newton of the ball. Denver recovers for a touchdown that gives them a 10-0 lead. Carolina’s offense never leaves the gate to take off for flight. Despite an anemic offense, Denver wins 24-10 with the help of a few critical turnovers. “How did you know Denver had a chance?” you ask your friend. “I told you, there’s this analytics guy…” he replies. 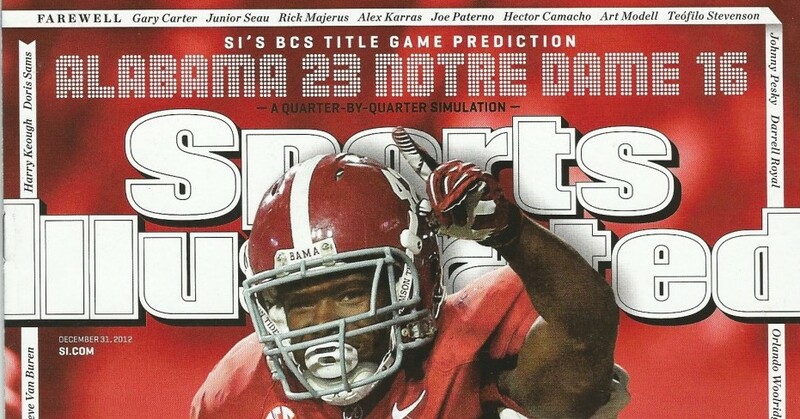 In January of 2013, I predicted Alabama would beat Notre Dame on the cover of Sports Illustrated. They called me their analytics expert. Now, I’m a college football columnist for Bleacher Report, and I’ve contributed to Grantland, Deadspin and SB Nation among other media outlets. A FiveThirtyEight showed that my 2015 NCAA tournament predictions were the most accurate, and my numbers have also appeared on Business Week and CNBC among other media outlets. I want to tell you about the membership product that gives you access to my best football predictions and team pages. But first, let’s take a look under the hood at the engine that drives these analytics. 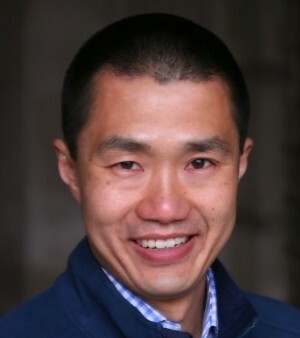 From this network, the method develops a set of equations to be solved. For college football in 2016, there are 506 equations (two for each of 253 teams) with 506 unknown variables. The algorithm solves for the 506 variables simultaneously in college football. This is the key to accurately accounting for strength of schedule. Many other ranking systems do not do this. Members of The Power Rank have access to my computer predictions for college football spreads and totals. These calculations are based on points and yards based metrics, with schedule adjustments made by the algorithm I developed. Through December 5th for the 2016 season, these are how the spread predictions have performed against the median closing line from Don Best. These numbers inform the college football prediction service in which Mike Craig and I find spreads and totals with value in the markets. This handicapping service has won 56.0% of its picks during the 2014 and 2015 seasons (141 wins, 111 losses with 7 pushes). Let’s also look at how the computer predictions performed against the markets. Since we started posting totals in week 6 of the 2015 season, these predictions went 55.7% against opening totals (280-253-5) and 51.4% against closing totals (255-241-5). However, these numbers do not tell the entire story. When the predicted total differed from the opening total by more than 4 points, the market total moved in the direction of the prediction 95.9% of the time (141-6, with five totals that didn’t move). On average, the final total moved 3.6 points in the direction of the model prediction. Some refer to this as closing line value. For the entire 2015 season, the spread prediction picked the game winner in 76.2% of games (583-182). Against the spread, the predictions for members were 50.3% against the opening line (376-372-15) and 50.9% against the closing line (379-366-17). Usually, the computer predictions perform better against the opening market spread, but not this season. I spent a long time searching the web for analytics rather than picks. I finally found it with The Power Rank. I signed up for the power rating and point spread analysis for football and am quite pleased with the offerings. I need to have consistent line anticipation/prediction through objective reasoning to begin my weekly evaluation. Your site offers such reasoning on an excellent basis. You provide an excellent foundation for determining the correct line. This assists me greatly with establishing my betting line for the week, and I’m able to adjust my line for non-objective factors knowing that objective factors have been taken into account. I would recommend a membership to anyone in search of strong analytical reasoning and objective line determination. — Jeff, Las Vegas, NV. To become a member of The Power Rank for $79 per year and get instant access to the premium content, click on the orange “Add To Cart” button. You can also pay with PayPal, JCB and Diner’s Club. A membership to The Power Rank offers more than just predictions. You also get insight into matchups. This insight starts with rankings that break an offense or defense down into passing and rushing. Again, yards per play serves as the primary statistic. It’s most useful to view these statistics for an offense next to an opposing defense. To explain how this works, this visual shows the rushing matchup between Ohio State and Oregon in the 2014 national title game. For the defense rankings, the better units appear further to the right. This makes it easy to compare with the opposing offense. The unit with the dot farthest to the right is predicted to have an advantage in the matchup, showing Ohio State’s advantage in the run game. The team pages use this basic idea to look at matchups for offense against defense. 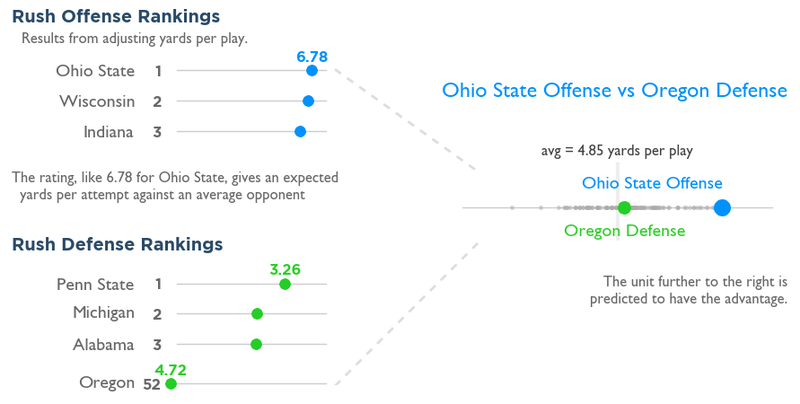 For example, consider the matchup of Ohio State’s offense versus Oregon’s defense. By looking at this visual, I was able to pick out Ohio State’s advantage in running the football. During the game, Ohio State running back Ezekiel Elliott gashed the Oregon defense for 246 yards on 6.8 yards per carry and 4 touchdowns. My analysis of this mismatch appeared on Deadspin prior to the game. Here’s what a commenter said about the analysis. Moreover, the team pages, which are updated the morning after any game, are interactive. Click on an opponent in the schedule to see the matchup visuals for a different game. To play with a sample team page, click here. It’s like having a cheat sheet that makes evaluating other teams easy. 4 college football win totals with value in the markets. Predictions for the spread in every college game, totals after week 6. 128 college football team pages that let you instantly evaluate a game. Predictions for the spread in every NFL game. 32 NFL team pages let you instantly evaluate a game. Data files for upload into a spreadsheet with all the numbers. My full bracket advice for the NCAA tournament. All predictions are posted by Tuesday at noon Eastern during the football season. It starts with an algorithm I’ve developed that does for sports analytics what Google’s PageRank did for web search: brings order and insight into a messy system. In 2015, the totals predictions went 55.7% against opening totals of the market and accurately predicted line movement. To get a deeper insight, the algorithm is used to rank offenses and defenses based on yards per play. I also break this down into passing and rushing. The team pages visualize these numbers so you can instantly evaluate a game. The statistics make you smarter about football because they account for strength of schedule. The team pages let you instantly evaluate a game. For less than $5 a week during the football season, you get access to all the football analytics at The Power Rank. This is not a handicapping service. If you’re interested in picks, you can check the college football prediction service. The data visualizations work on almost all modern browsers. The lone exception is Internet Explorer 8 and earlier versions. If you can view this sample team page, you’re all set. Otherwise, I recommend a free download of Google’s Chrome browser. Please take up to 30 days to evaluate the predictions and visualizations. 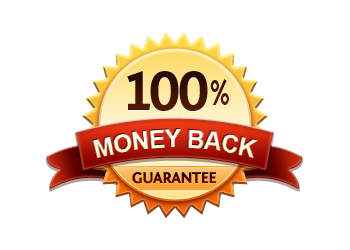 If you’re not satisfied for any reason, I will refund your money. Simply reply to the email you’ll get when you purchase. I will personally take care of the rest.